Acharya Mahaprajna has a large cohort of saints and nuns motivating the countless ignorant on the track of non-violence. Acharya's non-violence is all-pervasive that embraces all human beings, beasts, flora-fauna, water and mother earth etc. Born on 14th June 1920 in a small village of Tamkor in Rajasthan he was endowed with unique talents since childhood. He renounced family and worldly comforts to embrace monkhood at the tender age of 10 on 29th January 1931. At 22, he acquire laudable competency in Hindi, Sanskrit, Prakrit and Rajasthani languages and literature. He immersed himself in the intensive study of Jain Agam, History, Philosophy, Doctrinal lessons, Nyay, Grammar etc. His expertise and mastery in research & editing fields led to his successful foray into the world of Science, Ayurveda, Politics, Economics, Communism, Sociology and Literature. A growing number of colleges, universities, intellectual seminars and conventions have invited and welcomed his views adding remarkable perspective to their discussions. 29th January 1931, (Magh Shukla 10 in 1988 in Jain moon calender) at Sardarsahar (Rajasthan): Named as Muni Nathmal. Shrimad Kalu Gani ( The 8th Acharya i.e. the supreme head & preceptor of the religious order of Jain Shwetambara Terapanth). Nikaya Sachiva (Chief Secretary of Terapanth). Acharya Shri Tulsi nominated him (Muni Nath Mal) as the Nikaya Sachiva of Terapanth in 1965 at Hissar, (Haryana). Mahaprajna ( A Great Seer). Acharya Shri Tulsi conferred on him the epithet of "Mahaprajna " (A Great Seer) in recognition of his outstanding wisdom and erudition in 1978 at Gangasahar, (Rajasthan). Acharya Shri Tulsi nominated him (Muni Nath Mal) as his successor- designate (Yuvacharya) on 4th February 1979, at Rajaldesar, (Rajasthan) and changed his name to "Mahaprajna" .Then onwards he became known as "Yuvacharya Mahaprajna" . Jain-Yoga-Punruddharak (Resurrector of Jain Yoga). Acharya Shri Tulsi conferred on him the epithet of "Jain-Yoga- Punaruddharaka" in recognition of his unique researches in the field of Jain Meditation and Yoga. Acharya Shri Tulsi announced the relinquishment of his post of Acharya and conferred the same on Yuvacharya Mahaprajna on 18th February 1994 at Sujangarh. 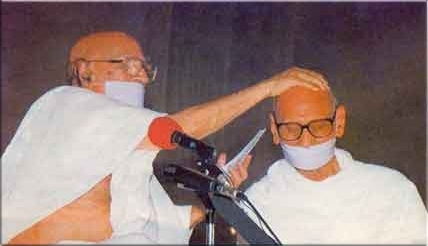 Later on, in a glorious function at Delhi, on 5th February 1995, he formally consecrated him as the l0th Acharya of Terapanth. The 10th Acharya, the religious head of Terapanth Svetambara Jain, rediscovered the missing link of Jain meditation, 'Preksha Dhyan' which he developed together with 'Jeevan Vigyan' (science of living) to an appropriate means for healthy and happy life. Self restraint is my strength.